WASHINGTON — U.S.-backed Kurdish fighters known as the People’s Protection Unit, or YPG, are fielding a monster-sized 12.7 mm homemade sniper rifle pieced together from other weapons. The innovative rifle, commonly called the Zagros rifle, employed by the Kurdish militants highlights the limited arms and weapons the group actually has in its fight against ISIS in Syria. The U.S. decision to arm the Kurdish fighters drew the ire of NATO ally Turkey because of the group’s alleged association with the internationally designated terrorist group the Kurdistan Workers’ Party, or PKK. As such, the equipment provided to YPG is minimal and doled out on an as-needed basis, according to officials at the Pentagon. The weapons include machine guns, mortars, rocket-propelled grenades and some light armored vehicles. The list lacks the sophisticated weapons technology that other allies in the fight against ISIS have. One example would be the weapons Iraqi forces employed in their drive to liberate Mosul. As a result, the Kurdish fighters have been innovative in their drive to field and develop weapon systems to bridge capability gaps. One such invention is the homemade Zagros sniper rifle. The rifle provides stand-off distance for Kurdish fighters and is capable of puncturing light armored vehicles like the suicide bombs driven by ISIS fighters or breaking through concrete walls to take out concealed ISIS fighters. Some might at first confuse the gigantic sniper rifle with the M107 Barrett .50-caliber sniper rifle used by today’s U.S. Marine Raiders because of its massive size and similar caliber round. However, the Kurdish rifle is homemade in northern Syria. Kurdish militants salvage parts from a 12.7 mm DsHK Russian heavy machine gun and use the trigger from an RPG launcher, according to Neçirvan Zirek, the nom de guerre of an international YPG volunteer who served as a sniper with the U.S.-backed fighters. 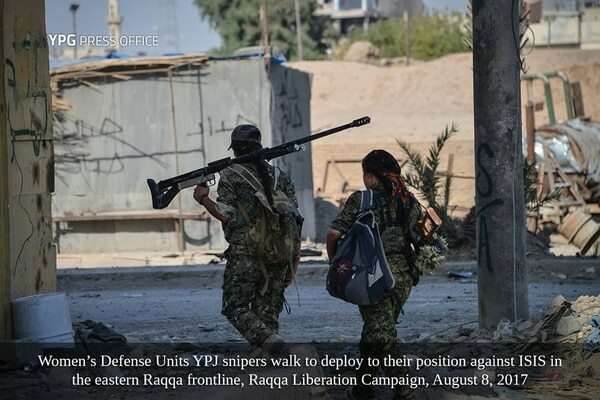 A sniper with the Women's Defense Unit, or YPJ walks to her position carrying a Zagros sniper rifle. Because powerful magnification optics for the rifle are hard to come by, the Kurdish militants use whatever they can find, usually Chinese scopes or pilfered optics on the battlefield, he added. 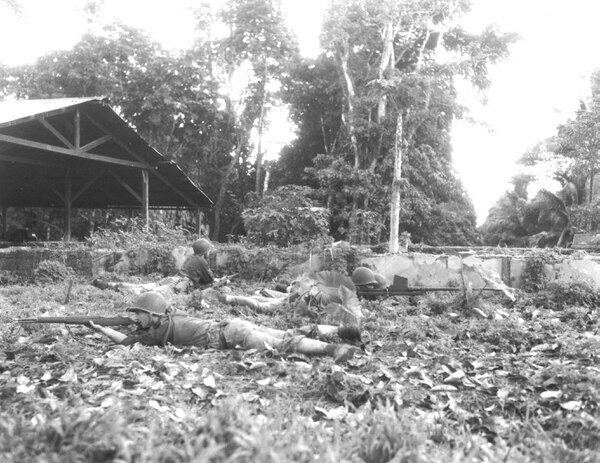 A Marine Raider anti-tank squad in action. This concept of modifying other weapon systems to field high-caliber, anti-materiel rifles is not new, according to retired Marine Corps Col. Steven Walsh. Walsh is a graduate of the Marine Corps Scout Sniper Instructor School, and he ran the schoolhouse for three years as a captain from 1985 to 1988. Marine Raiders of World War II modified the British Boys anti-tank gun in the 1940s by placing a scope on it and using it as a sniper rifle, he told Military Times. The Boys anti-tank rifle, or Elephant Gun, as some like to call it, was built for lightly armored vehicles and as an all-around anti-materiel rifle. The gun featured a whopping 14.7 mm cartridge, 10-round magazine, and a massive 36-inch barrel. But it wasn’t generally employed as a sniper rifle until it was modified by the Raiders during World War II. The Zagros gun is used for both soft targets and anti-materiel, but it depends on the type of ammunition you use, Zirek said. “My standard load out for this rifle was 12 API [armor piercing incendiary] rounds, four [armor piercing incendiary tracer] rounds, six AP [armor piercing] rounds, six ball and four ball tracker rounds. Then I carried the exact same load out in my ruck and always had surplus in the truck,” Zirek said. Getting the ammo YPG snipers need is really hard to come by, according to Zirek. But the rifle and ammo aren’t everything — YPG snipers still require good training. According to Army Col. Joseph Scrocca, spokesman for Operation Inherent Resolve, Syrian Democratic Forces, which includes the YPG, have received long-range rifle marksmanship training. But the training that the YPG offers its snipers is only two weeks long, and they get to fire a total of about 20 rounds, which is not enough, according to Zirek. “The [Zagros] rifle itself is pretty accurate when you apply all of your marksmanship principles and spend the time to build data sheets for your ammo and rifle. Most of the ‘snipers’ in Syria do not have this training,” Zirek told Military Times.